ST. GEORGE – Washington County ranked high among a list of places experiencing the most growth in their local economy in a new study released this month by SmartAsset. Counties were measured by change in the local gross domestic product over a four-year period. The study aimed to capture the places across the country that are receiving the most incoming investments in business, real estate, government and the local economy as a whole, according to the SmartAsset website. To do this, the study looked at four factors: business establishment growth, GDP growth, new building permits and municipal bond investment. To see whether or not people are starting new business ventures in the county, the study looked at the change in the number of businesses established in each location over a 2-year period. According to the study, Washington County placed third in business growth in Utah and 245th in the nation. In Utah, Duchesne County is ranked No. 1. Dunn County, North Dakota takes the No. 1 spot for business growth in the nation. The second factor the study looked at was the gross domestic product growth, using real growth (inflation adjusted) in the local economy. Washington County ranked No. 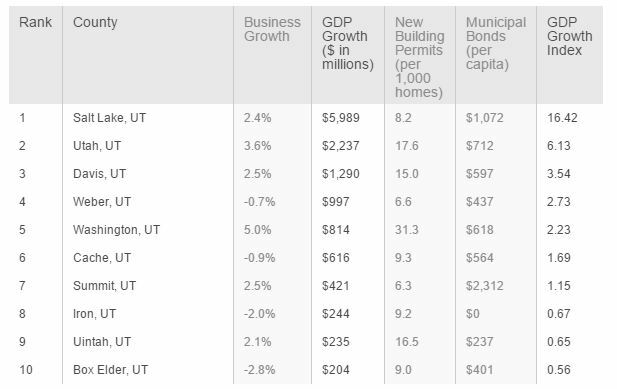 5 in Utah for GDP growth and 204th in the nation, according to the study. 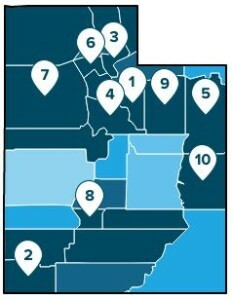 In Utah, Salt Lake County is ranked No. 1. The No. 1 spot for GDP growth in the nation goes to Los Angeles County, California. Additionally, the study looked at investment and development in the local residential real estate market. To measure the real estate growth, the study calculated the number of new building permits per 1,000 homes. Washington County ranked second in the state for new building permits issued and eighth in the nation, according to the study. 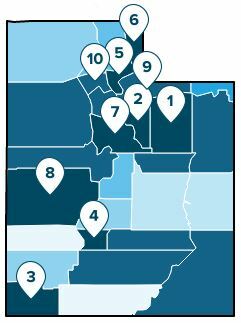 In Utah, Wasatch County is ranked No. 1. Forsyth County, Georgia holds the No. 1 spot for new building permits issued in the nation. The final factor the study considered was investment in municipal bonds. The study found the average municipal bonds raised by a county over the last five years, which was then divided by the population, offering a per capita look at investment in local government or agencies. According to the study, Washington County ranked No. 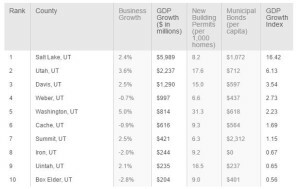 10 in Utah for municipal bonds and 1,029th in the nation. In Utah, Sevier County is ranked No. 1. The No. 1 spot for municipal bonds in the nation goes to Sibley County, Minnesota. The study scored every county on those four factors, weighting each factor equally, according to SmartAsset. Those scores were then combined to create a final ranking of cities. With that ranking, an index was created where the county with the most incoming investments was assigned a value of 100 and the county with the least investment activity received a zero.